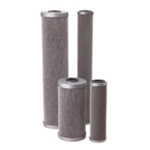 C Series Dual Purpose Power Activated Carbon Cartridges offer an economical solution for all your general purpose water filtration needs. 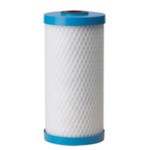 Constructed of a carbon-impregnated cellulose media, these dual purpose cartridges filter out fine sediment particles and reduce unwanted taste, odor, and chlorine odor from tap water. A polyester reinforcement backing and external netting provide additional strength and dirt-loading capacity. 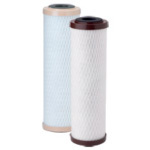 • Polishing filter for process or closed-loop stream. 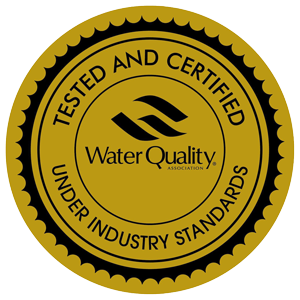 • The C1 is Tested and Certified by NSF International to NSF/ANSI Standard 42 for material requirements only. NCP Series cartridges are constructed from a carbon-impregnated non-cellulose media. 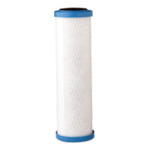 They offer sediment filtration, as well as taste, odor, and chlorine taste & odor reduction in one cartridge. Unlike cellulose cartridges, NCP Series cartridges are resistant to bacterial attack allowing them to be used for municipal and non-chlorinated water applications. CBC Series cartridges are highly effective at reducing unwanted tastes and odors, including chlorine taste & odor, from potable drinking water. The unique structure of the carbon block enables it to reduce Giardia, Cryptosporidium, Entamoeba, and Toxoplasma cysts and fine sediment particles down to 0.5 microns. Coconut-based carbon block cartridges are highly effective at reducing unwanted taste & odor, including chlorine taste & odor from potable drinking water, and they are equally effective at reducing fine sediment. Coconut-based carbon block cartridges are manufactured using a patented process and are made from a water-washed, coconut carbon formulation. This process and media yield a cartridge with high chlorine taste & odor reduction capacity. 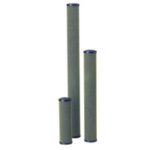 EP Series carbon briquette cartridges are manufactured using a patented process that yields a cartridge with a nominal 5-micron filtration rating, high dirt-holding capacity. A high porosity design helps prevent the cartridge from plugging before its adsorption capacity is exhausted, maximizing the utilization of the carbon while maintaining low pressure drop. These cartridges are protected by Endurawrap®, a uniquely formulated poly olefin bi laminate pre filter, designed to significantly increase the useful life of the cartridge by trapping sediment that typically plugs carbon block cartridges. This EP-10, EP-20, EP-BB, EP-20BB are Tested and Certified by NSF International to NSF/ANSI Standard 42 for material requirements only. EPM-10C cartridges are a modified version of our "EPM Series" cartridge. An economical price makes this cartridge suitable for taste, odor, and chlorine taste & odor reduction, as well as sediment filtration. 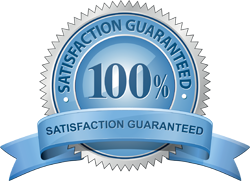 EPM-10C cartridges are manufactured using a process that yields a cartridge with a nominal 10-micron filtration rating and higher porosity. The high porosity design helps prevent the cartridge from plugging before its adsorption capability is exhausted, maximizing the utilization of the carbon while maintaining low pressure drop. PENTEK® offers multiple product solutions for chloramines reduction. Chloramines is increasingly becoming more common as an alternative to chlorine for water treatment. The ChlorPlus® carbon block cartridges help reduce sediment while providing greater chloramines performance capacities than granular carbon. 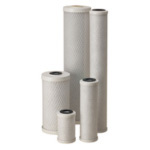 They also significantly reduce the carbon fines found in many granular canisters. The CRFC20-BB heavy duty radial flow cartridge measures 4-1/2" in diameter and 20 inches long, which is ideal for higher flow rate and capacity applications. 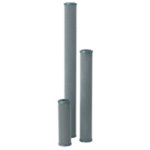 This cartridge incorporates a 70-micron porous polypropylene outer shell and a spun polypropylene-wrapped core. The bed of granular activated carbon (GAC) between the outer shell and core creates a unique radial flow design which effectively removes chloramines, has a low pressure drop, and helps to reduce fines commonly seen in GAC-style cartridges. CFB Series cartridges provide the effective chlorine taste & odor reduction found in traditional carbon block media while offering excellent sediment reduction capabilities. CFBC Series Series cartridges offer the effective chlorine taste and odor reduction found in traditional carbon block media while providing superior sediment reduction with resistance to premature plugging. 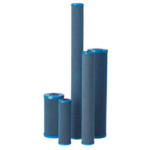 They are highly effective at reducing chlorine taste & odor, as well as some organic chemicals. The CFB-Plus Series cartridges are an enhanced version of our CFB product. It offers the same benefits with even greater chlorine taste & odor reduction and the highest sediment reduction found in a carbon cartridge. CFB-Plus Series products are modified molded blocks manufactured using our proprietary Fibredyne technology. 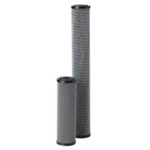 This technology creates a unique filter media by attaching powdered activated carbon onto a cellulose-free synthetic fiber matrix. 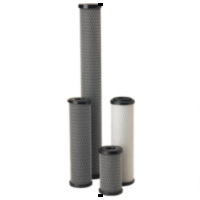 The result is a single cartridge that combines the benefits of both a sediment filter and a carbon block into a single cartridge. 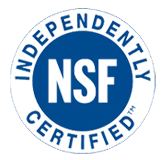 Tested and Certified by NSF International to NSF/ANSI Standard 42 for materials requirements only. 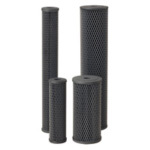 The ELPC Series is a premium line of activated carbon filter cartridges specifically designed for electroplating solutions. 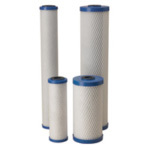 They represent the best technology available in cartridge filtration for use in a wide range of electroplating applications. The unique technology used to manufacture this product ensures that there is no bleeding of carbon fines into the plating bath. In addition, the carbon that is used is an ultra-clean, highly purified carbon to ensure that sulfur is not leached into the plating path. FloPlus® cartridges utilize a revolutionary new technology that significantly enhances the traditional Fibredyne® product, making it possible to obtain cyst reduction in a cartridge that functions like a nominal 10-micron cartridge. This product boasts extremely low pressure drops and high flow rates — comparable to 10-micron (very open) carbon cartridges. Its efficiency is so high that a 0.5-micron rating is possible, which means that cysts and very small particles can be removed to create cleaner, safer water. The FPS-10 with the FloPlus 10, FPS-20 with the FloPlus 20, FPS-10BB with the FloPlus 10BB and the FPS-20BB with the FloPlus 20BB are Tested and Certified by NSF International to NSF/ANSI Standard 53 for the reduction of Cysts.